New research shows that bipolar disorder risk is higher in the US than in the Netherlands. At the 2015 meeting of the American Academy of Child and Adolescent Psychiatry, researchers Manon Hillegers and Esther Mesman described a study in which they compared the offspring of mothers with bipolar disorder in the US to those in the Netherlands. The offspring ranged in age from 10–18. In the US, the mothers had, on average, an earlier age of onset, more substance abuse comorbidity, and were more likely to have been diagnosed with bipolar II disorder. Among the US offspring, 66% had been diagnosed with a psychiatric illness compared to 44% of the Dutch offspring. This included significantly higher rates of anxiety, ADHD, and disruptive behavior disorders in the US offspring. Among the offspring who had been diagnosed with a mood disorder, 80% of those in the US had other additional psychiatric disorders, but only 34% of the Dutch did. 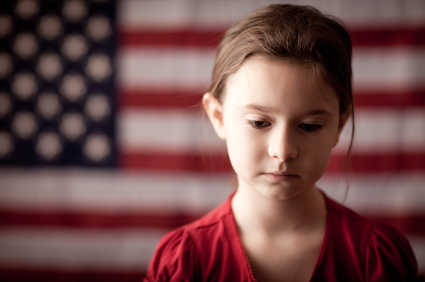 Bipolar disorder is more rare among children under the age of 12 in the Netherlands compared to the US. Dutch children and adolescents were typically treated with lithium and with only one drug at a time. In the US, lithium is less widely used, and simultaneous treatment with several medications (usually including atypical antipsychotics) is common. Editor’s Note: The research by Hillegers and Mesman replicates research by this editor (Robert M. Post) and colleagues that compared bipolar disorder incidence and severity in the US, Germany, and the Netherlands. Other comparisons have been made between the US and Europe. A 2014 article by Frank Bellivier and colleagues in the World Journal of Biological Psychiatry also showed that bipolar disorder onset occurs earlier in the US than in 10 different European countries, while Bruno Etain and colleagues found that bipolar disorder onset occurs earlier in the US than in France in a 2012 article in the Journal of Clinical Psychiatry. Together this research shows that bipolar disorder is more serious in the US than in a number of European countries. Two-thirds of adults with bipolar disorder report that their illness began in childhood or adolescence. Most of these cases are not properly diagnosed or treated. A concerted effort must be made by the medical establishment and healthcare policymakers in the US to provide better and earlier treatment of bipolar illness. A poster by Aditya Sharma of Newcastle University and colleagues at the Pediatric Bipolar Conference assessed the incidence of childhood-onset bipolar illness based on monthly letters sent to approximately 750 consultants in child and adolescent psychiatry in the British Isles. Only five confirmed cases were reported, with the youngest child being 11 years old. 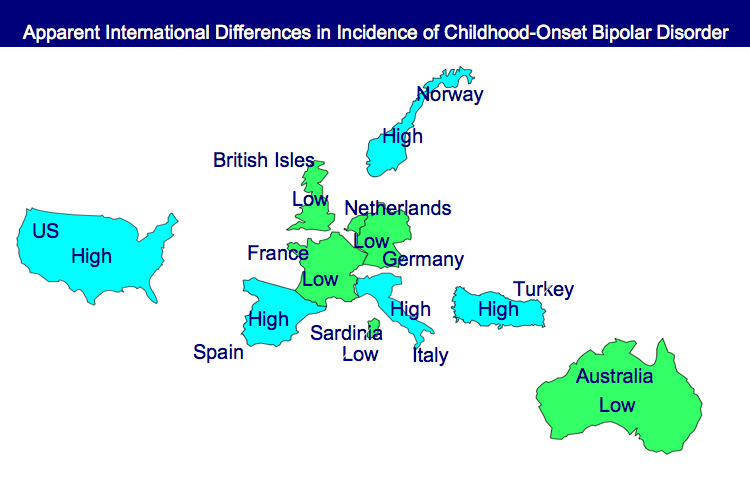 EDITOR’S NOTE: These data are of particular interest in relationship to earlier data indicating that childhood-onset bipolar disorder may be relatively rare in some European countries, including the British Isles, France, the Netherlands, and Germany, as well as in Australia, South Korea, and New Zealand. In contrast, childhood-onset bipolar illness with an onset prior to age 13 appears to be prevalent in the US, with one-fifth to one-quarter of adult outpatients reporting onsets of either depression with dysfunction or mania prior to age 13. Another substantial group of patients report onsets in adolescence, indicating that some 50-66% of bipolar illness in the US begins in either childhood or adolescence. Similarly higher amounts of childhood-onset bipolar illness are reported in Italy, Turkey, and Norway, indicating some heterogeneity of vulnerability factors and course of illness outcomes among different European countries.